Blue Ceramic Mug: Monday Midterm Madness!!! Okay, I just liked the alliteration. I'm not panicking and I'm actually kind of looking forward to my midterm this evening. Why? Because it's open book, I really like the subject matter, and I think it'll be awesome :) (For those who don't know, I'm taking "Histoire de la langue française" at UQO as part of my Bachelor degree in Translation.) However, the exam doesn't start until 7pm, so what will I be doing before that? I'm going to the gym :D I have my second session with Avril the wonder-trainer tomorrow, and I didn't visit the gym over the weekend. Not for lack of time/willingness, but because I was working a shift each day at the store, and I figure that 4 hours on my feet is enough of a workout ;) I'm going by myself, I'm going when the gym will be busier than mid-day, and I'm going to enjoy it! I think I discovered endorphins last week, and I think I like them! In the knitting world, I have a new project that I'm extremely excited about (I started to type "super-excited", thus revealing my French side to everyone... Anyone who's ever met a bilingual franco-ontarian knows that we use "super" for everything in English). 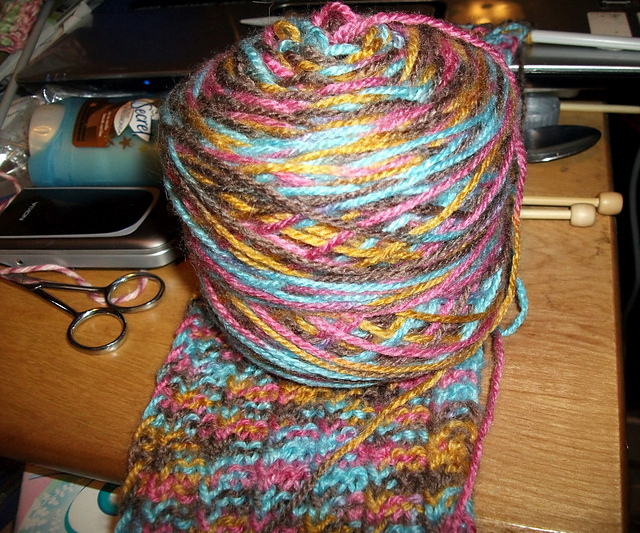 Anyway... the girls at Knit Night know that I've been going bonkers over the Yarn Harlot's One-Row Scarf. I can not get enough of this thing. I've got several on the needles, and I never get bored with it! I was thinking to myself, "Self," I said, "we don't wear scarves... so what are we planning on doing with all these scarves?" This was surely a connundrum. I thought about it for a while, and then got a flash of inspiration. I've been trying to figure out how to donate to Doctors Without Borders (to support the Knitters Without Borders effort), since I don't have a credit card, and don't really like mailing cheques (or anything, as evidenced by the Valentine card I got Rob, which is currently sitting on my desk mocking me). I also don't make a tonne of money, so the opportunity to donate is rare. So I looked at this pile of scarves I'm making, and I put that together with the KWB thing... and lightning struck my brain. I had an apostrophe! Why don't I sell the scarves as a means of raising funds and donate the proceeds to KWB/DWB? I realize that the pattern doesn't belong to me, and isn't meant to be sold, so I did what any responsible knitter would do, and I asked the designer for permission. Yes, I emailed the Harlot herself to ask if I could use her pattern for this effort. Dudes, I do not need to tell you how I squee'ed like a fangirl when I got her reply. I'm not even exaggerating. I squee'ed out loud, scaring the crap out of both cats and deafening Rob in the process. I was so excited, I could barely sit still to read the email! So with her kind permission, I'm going full steam ahead with this project :) I will knit as many one-row scarves as I can, and then try to sell them for $15 each to raise money for Doctors Without Borders. 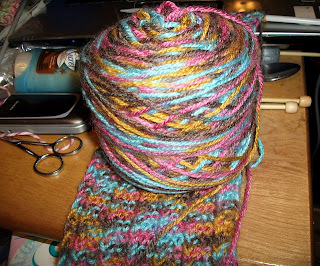 I'm using stash yarn to do this, so there will be all kinds of scarves. Cotton, wool, acrylic, nylon, bamboo... I've got piles of yarn, so I'm going to try to make as wide a variety as I can.